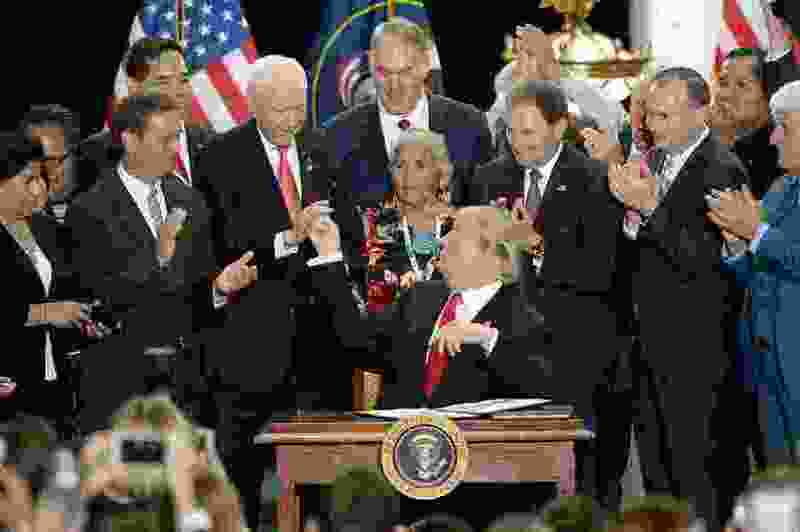 (Francisco Kjolseth | The Salt Lake Tribune) U.S. President Donald Trump, surrounded by Utah representatives looks at Sen. Orrin Hatch to give him the pen used to signs a presidential proclamation to shrink Bears Ears and Grand Staircase-Escalante national monuments at the Utah Capitol on Monday, Dec. 4, 2017. A conservative estimate of the cost to U.S. taxpayers for Trump’s junket to Salt Lake City is $2 million. And what did we get for this presidential day trip? Humiliation for Native Americans and their culture. Eviscerated national monuments whose original boundaries were supported nearly unanimously by their owners, the American people. Reduced protection for priceless archaeological and paleontological sites and future discoveries. A chance for our “representatives” from a highly unpopular Congress to get smarmy mug shots with a highly unpopular president. I am sickened by this action against places I hold dear, and some, who deserve our respect, hold sacred. Trump’s attack goes beyond the trite “monumental mistake” and reaches the near boundaries of crime against humanity. This, sadly, is the norm for this administration. Hopefully, the courts will judge Trump and his sycophants summarily wrong. If courts do not, however, history surely will, and $2 million will be a minuscule down payment on the public lands carnage.